Roses always have been special to the Missouri Botanical Garden. Visitors to the Missouri Botanical Garden’s two rose-garden displays can feast their eyes on hundreds of individual plants encompassing many different varieties. 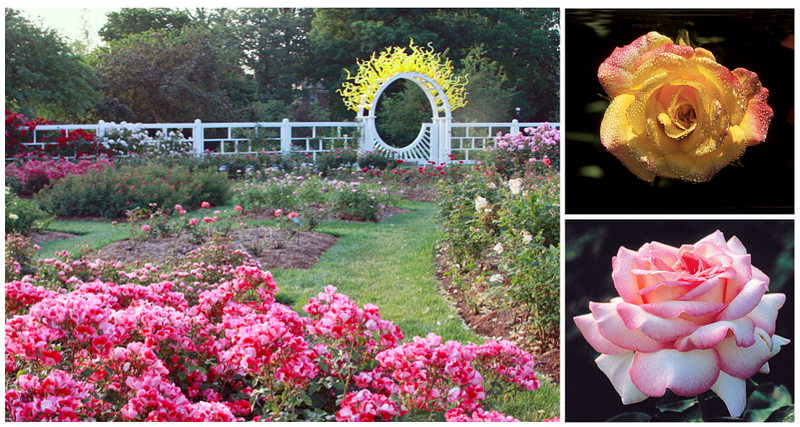 The garden's collection contains roses known for their hardiness and disease resistance in the St. Louis region. The Gladney Rose Garden has been in existence since 1917, when it housed many old garden roses. Shaped like a giant wheel, this garden displays hundreds of hybrid roses. Many climbing-rose varieties are featured on the formal fence and arbors that enclose it. Peak display lasts from early summer through autumn. The Anne and John Lehmann Rose Garden, established in 1976, has been called the more romantic of the two gardens, with a mix of floribundas, shrub roses and other classifications. It is less formal than the Gladney Rose Garden and contains hundreds of roses representing many different varieties. The Lehmann Rose Garden also mixes the delight of aromatic flowering plants and water. The Shapleigh Fountain is set in a circular brick plaza 50 feet in diameter with three curtains of water that rise and fall. It also features the Lehmann Gazebo with a fountain and pool, offering a shady respite during peak blooming time. Edging the first terrace is the lovely Kercheval Pool, a low-bubbling fountain. A mix of species roses and perennials grow in this garden, showing how roses can be utilized among other plants.